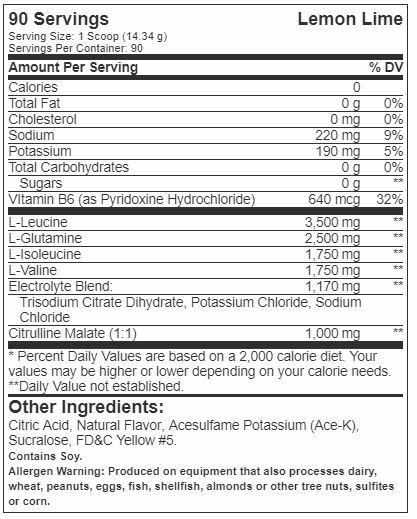 Additionally, in an attempt to dazzle you with numbers, some lopsided amino formulas drop the amounts of Valine and Isoleucine in favor or Leucine - a critical mistake - which ends up smothering some other very important benefits. For one, Valine competes with Tryptophan for uptake into the brain, and a brain soaked in Tryptophan will have a much hard time relaying the message to the muscles that they need to work harder and push more weight. Furthermore, in a Japanese study, scientists observed a fat-burning mechanism dependent upon Isoleucine. Subjects who consumed more supplemental Isoleucine gained less body fat than those who did not, even though both groups ate a high-fat diet. Directions For Xtend: nAs a dietary supplement, mix one scoop per 8-10 oz. of water. Shake well and consume during exercise on training days, or throughout the day on non-training days.